A perfect utensil to make Appa, a famous Maharastrian dish. 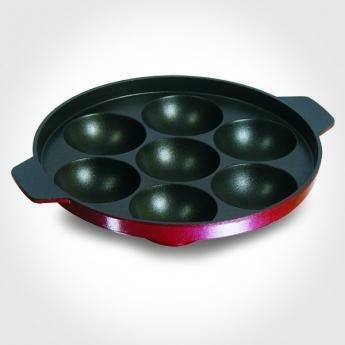 Appampatra is long lasting non-stick cookware, it has sturdy non-stick coating. Non-stick coating ensures the natural properties and taste of food when cooking. The Coating absorbs very little quantity of Oil, Ghee or Butter. It has made of high quality aluminium tough base the coating ensures equal distribution of heat. Thus Saves Fuel.& Easy to clean & guaranteed not to stick & only wooden spatula to be used. The company has recently opened a direct marketing section targeted at women who wish to widen their horizons and use their time and talents profitably. Future plans include joint ventures with leading international business houses to bring to India the latest and the best innovative products and the introduction of customer care centers all over India. Diversification into the consumer non – durable is also on the anvil. Jaipan Teleshopee Division is also planning to introduce many more Health Care products in near future. The company is also planning to export Gold Ornaments to European countries including Middle East countries also.